With the vernal equinox of last week heralding in equal amounts of day and night it seemed to finally announce the arrival of Spring, and we were certainly treated to unseasonally but welcome hot and bright weather. These conditions are not usually ideal, but for once it didn’t seem to put the fish ‘off the take’:- the result being there was a considerable list of double digit returns recorded in the book. Those fortunate fishers included Paul Sharp who skillfully used a team of buzzers to bring 21 fish to the net. Likewise Graham Duthie had 21 fish using various lures and noted in returns book:- ‘As long as they are black. 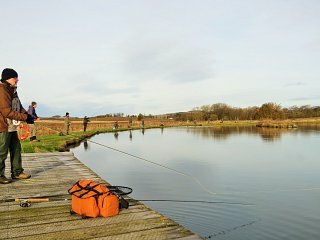 Les Mess from Ellon had 18 fish using the new Chammois fly, while A Greig had a great day using damsels to account for 17 fish. Stuart Sim from Ellon had a good haul of 15 fish, all on buzzers and M Moodie took 14 fish, all on a green lure. Mike Frost true to his name kept a cool head in the heat and landed 12 on the apply named hothead lures which were of various colours and A Greig did well using various damsels to account for 11 fish. With the clocks having gone forward we are now open from 8am to dusk so why not take advantage of the excellent evening conditions that often arise. It’s the last reminder that the ever popular Lochter Spring Singles (Springles) Competition takes place this Sunday 2nd April with a 9.30am start. It’s a fun and friendly competition and if you haven’t taken part in one before then this one is the ideal starter competition for you. There are some lovely prizes and the £20 entry fee includes your lunch. There are now only a limited amount of places still left so please contact Stuart at Lochter Fishery on 01651 872787 to secure your entry place.